Approximately 13,000 MyKid cards have not been collected and why they should remain so. 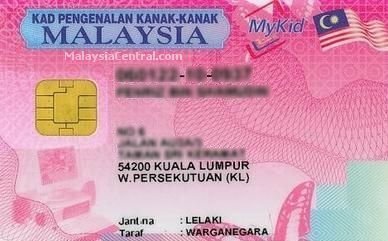 On 2 June 2010, the National Registration Department (NRD) Director, Alias Mamat reported that there were about 13,000 MyKid cards that were not collected dating back to 2004 despite 21,000 of them being issued as at April 2010. “We are not sure why parents are refusing to pick up the MyKid cards after obtaining their children’s birth certificate,” he explains during his visit to the Nanyang Siang Pau‘s office to receive 36 lost identification cards. “Carrying the card is so much easier compared with carrying the A4 size birth certificate,” he confirms going on to add that the MyKid was provided for the government for the convenience of the people. The news report of course does not make it clear what an NRD director was doing collecting lost identity cards at a Chinese local daily office like some despatch office clerk. It is also unclear in what context this information was given. What is clear though is that a majority of the parents (61.90% as derived from 13,000/21,000 x 100%) who have been issued with MyKid cards think it useless and a waste of time. Having seen these MyKid cards, I can understand why. Firstly, the card records the details of the child, i.e. date of birth, religion, etc. but there is no photo or thumbprint recorded on the card. This lack of photo identification makes the card easily transferable form one “kid” to another. If X and Y each had a baby and swapped their respective MyKid cards around, you would not be able to confirm this from looking at the card (unless the racial features were so obvious and the names confirmed a racial identity). Secondly, since there is already a birth certificate, why should you also need a MyKid card? Furthermore, the birth certificate is the more important of the two documents. Encik Alias Mamat says it is easy to carry the card around, but he appears ignorant of our domestic culture that nobody carries their birth certificate around but keeps it locked away in a safe so that it doesn’t missing. They also keep it very safe because they know it will be incredibly painful to get another from a government agency. 1. Reducing the use of forms in all dealings with government or private agencies. 2. Used in all dealings with departments or agencies such as hospitals or clinics for health examination, schooling, etc. 3. Easily carried due to its small size. 4. Has security features to prevent misuse. 5. Chip-based technology where information can be read on the card or in the chip. Information in the chip can also be easily updated. 6. Striking and interesting design. We’ve already considered 3. We’ve also covered how 4 and 5 are not true because of the lack of picture and thumbprint on the card makes it easily transferable. It is not clear how widespread 1 and 2 are since even MyKad machines and readers cannot read MyKid cards last time I checked at an NRD branch office. So from my count, item 6 is its best and truest feature – the MyKid has a striking and interesting design. But then I disagree with that too. It’s ugly because it comes in a shocking pink colour only. You cannot ask for sceneries of mountains, birds and women in bikinis to be printed on your MyKid card like you can with some of those department store customer loyalty cards. So what are we left with? A useless piece of plastic that nobody wants. But since it is a government policy, this means that somebody is making a fortune supplying, printing, and selling these useless MyKid cards to our government. That is why I tend not to believe him when he says that the card was provided for the convenience of the people. It is not. It unnecessarily and poorly duplicates the birth certificate. The MyKid cards more likely was implemented to give some crony an easy government project to make money from. What is done with it if the MyKid is not collected? Alias Mamat explains that the NRD will destroy an uncollected MyKad if it is not picked up after 18 months. The applicants would have to pay a compound to make a new identity card thereafter. What is strange is why MyKid can be left uncollected even longer – some as early as 2004 (i.e. 6 years ago)? Why the different policies? This, of course, is not explained because some of our local mainstream reporters could not be bothered to ask proper questions on issues that would be of benefit to the public. They are just quite happy to just record whatever crap an official, politician or whomever tells them something without any critical application or follow up question. It is not uncommon that the news reported raises more question than it seeks to clarify. A question one of them should have posed is why we need a MyKid. An article one of them could have written is why the MyKid should be abolished and how much the taxpayers will save on such wastage. But then, it’s the local mainstream media, and sadly many of them could not be bothered. Posted on 4 June 2010. You can follow any responses to this entry through the RSS 2.0. 5 Responses to MyKid You Not! I have politely refused a MyKid when my fourth child was born. The registration officer seemed puzzled on my refusal, and I duly explained to her. When applying for these things, we must bear in mind the Birth and Deaths Registration Act, or in the case of Sabah and Sarawak, their respective birth and deaths registration ordinances. It seems that there are many things we are required to do nowadays which are not in accordance with the law. And there are also things that seem to be denied to us, which also seem to contradict some laws!